So that's it then. Another Bulls season ends short of a title. But it was a hell of a ride, no? Noah has 15 rebounds. FIFTEEN. And Boozer has 9. Everyone else? Nowhere close. John Wall won't go away. Offensive rebound after offensive rebound after offensive rebound. But Wizards don't take advantage. 1 minute to play. Bulls down 3. Here we go. 16.2 seconds to go, Wizards up 3. Free throws coming for Andre Miller. So the Bulls needed the Wizards to miss two free throws. And it happened. And they didn't get the rebound. WHAT THE HELL?! Well, that will just about do it, folks. Bulls down 6 with 7.8 seconds to play. Timeout Chicago. Game over. 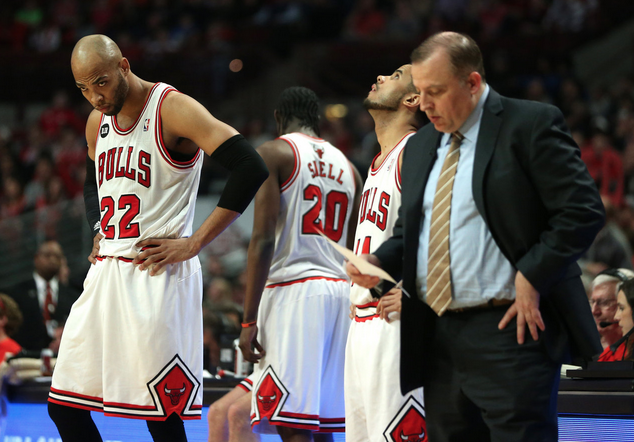 Bulls lose and are eliminated from the 2014 NBA Playoffs, eliminated in 5 games to the Washington Wizards. Postgame videos from the locker room coming from me and my partner-in-Basketball-crime Chris Sosa. Stay tuned, if you're into that sorta thing. HEY DRY YOUR EYES, CHICAGO. Remember this logo? YEAH BECAUSE THEY ARE GOING TO THE NEXT ROUND. PLAYOFF HOCKEY! WEEEEEE! Taj Gibson, on the possibility of winning sixth man of the year. Joakim Noah: "It hurts ... but I'm proud of these guys. They worked their asses off." Our Game 5 recap. A few Thumbs up for the Bulls. But mostly thumbs down.